How I Got Hurt: NOTE: It Could Be Because I’m Stupid by Larry Buenafe is a delightful collection of memoirs that revolve around the theme of embarrassing or awkward moments in life, ones that are memorable and which one may wish to forget for obvious reasons. 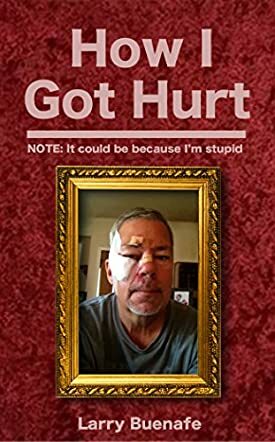 How I Got Hurt is written in a no-holds barred manner and starts off with an introduction by Larry where he explains the background and theme of the book. He also includes some dictionary definitions of words that would fit some of the descriptions in the book, such as hubris and stupidity. Of course, this is in a light vein and is followed by numerous short incidents or chapters from his life where he found himself in situations that could be described alternatively as foolish, embarrassing, humorous, at times humiliating, awkward, or even sad. But the underlying tone is amusing and light and these aren’t heavy or extremely serious situations and, as such, are meant to be taken with a dose of humor. I loved How I Got Hurt by Larry Buenafe and I found some of the stories quite hilarious. Larry’s writing style is charming, funny, and almost self-deprecating and, as a result, not only is he extremely candid about the events and happenings in his life, but he also enables the reader to empathize and relate to similar incidents in their own life. The memoirs themselves cover everything from acutely embarrassing situations to events that unfolded to have surprisingly unexpected consequences. This is a great and entertaining read and kudos to Larry for not being afraid to share his life’s moments in such an open, candid way.